Apple cider is the secret ingredient that makes the most incredible moist pork tenderloin! 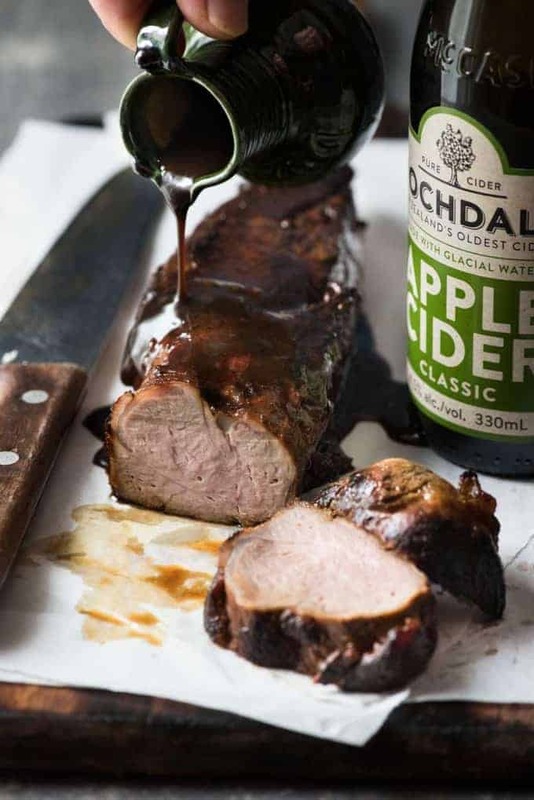 The marinade does double duty as an incredible glaze / sauce, which means few ingredients are required to make this Apple Cider Glazed Pork Tenderloin that’s worthy of a posh dinner party! Have you ever used apple cider as a marinade before? It’s like a secret weapon broth / stock. Because it’s got so many more layers than just plain apple juice or even broth, which means you don’t need many other ingredients to create incredible flavour! Just to be clear – I’m talking about alcoholic apple cider. In some parts of the world, including America, “apple cider” refers to a non alcoholic drink made from (this will surprise you 😉 ) apples. In America, alcoholic apple cider is known as hard cider. It’s like using beer in cooking but easier, because unlike beer, cider doesn’t have wheat undertones that needs to be cooked out. Apple cider tastes much cleaner and a bit sweet, but not overly so, it’s very crisp. I used Rochdale Apple Cider in my recipe. I feel very honoured that they asked me to sample their cider and if I liked it, to create a recipe using it. I was quite interested to read about how it is made. It’s so pure – made with just apple juice, pure New Zealand glacial water, and yeast. That’s it! Seriously! So I kicked back and sipped on a chilled bottle of Rochdale cider, contemplating what I could make. And came up with the idea to use it as a marinade…. But in all seriousness, check out how juicy this pork is! Pork tenderloin is notoriously hard to cook so it’s nice and juicy because it’s so lean. 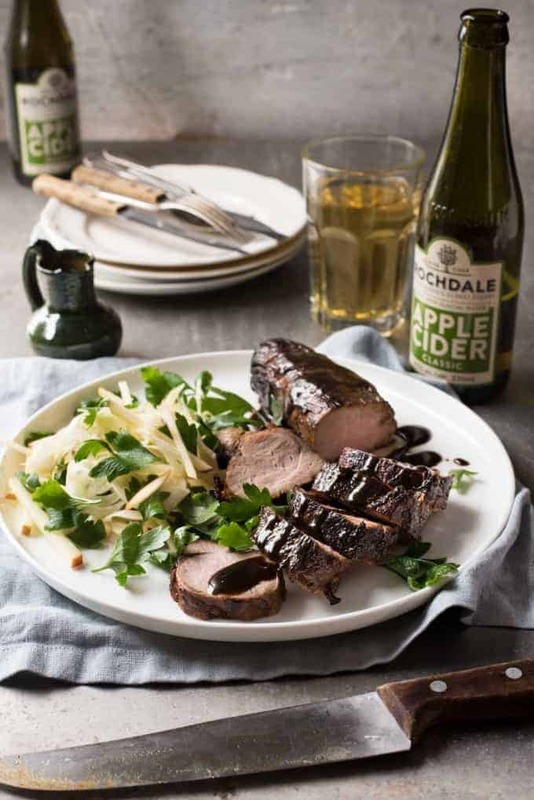 But when you brine / marinade pork tenderloin in apple cider….woah! I was amazed at the juices that squeezed out of it as I sliced it!! Here – see for yourself! Rochdale Apple Cider. Cook with it. Drink it. The best kind of ingredient there is!! It was after 12pm when I took these photos. Hence TOTALLY acceptable to have a sip….or two….ok, I finished the bottle. Don’t judge me. I served this with an Apple & Fennel salad because apple and pork are great mates, and fennel and pork are lovers. So I figured I couldn’t go wrong. I really do think this is a dish worthy of a dinner party. 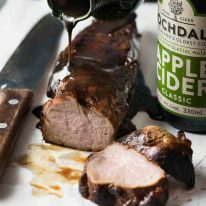 Apple cider is the secret to a marinade that makes pork tenderloin incredibly moist with a gorgeous glaze! The marinade also does double duty as the sauce. You will be amazed at the incredible flavour in this with so few ingredients! 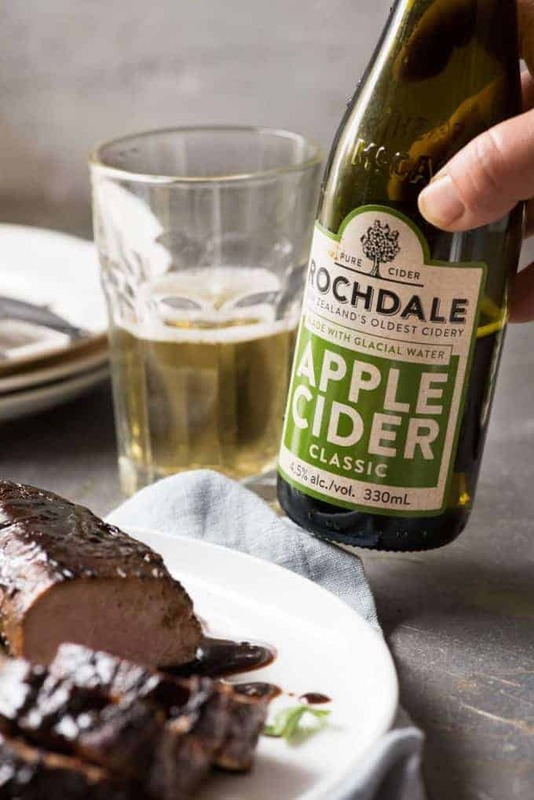 I used Rochdale Apple Cider for this recipe - a New Zealand cider that is available at all major liquor outlets in Australia including Dan Murphy's and Liquorland. Place Marinade and pork in a large ziplock bag and marinate in the refrigerator overnight, up to 24 hours. Remove pork in the marinade from the refrigerator 30 minutes prior to cooking (to bring to room temperature). Heat olive oil in a skillet over medium high heat. Remove pork from marinade (reserve marinade) and place in pan. Sear until golden brown all over - don't let it burn (Note 2). Remove pork from skillet onto a plate and cover loosely with foil to rest while you make the sauce. Place skillet on the stove over high heat with butter. When the butter is melted, add reserved Marinade and mustard. Whisk until smooth. Bring to boil, then turn heat down so it is simmering VERY rapidly, and cook until the liquid becomes syrupy - about 4 to 5 minutes. Adjust salt to taste. Remove skillet from the stove, roll pork in the sauce, then remove and slice. Pour remaining sauce in the skillet into a jug and serve on the side. 1. This recipe calls for alcoholic apple cider. I used New Zealand Rochdale Apple Cider. To make this non alcoholic, you will need more ingredients! But you can use any sweet alcoholic apple (or pear) cider you want! To make it non alcoholic, in place of the apple cider in this recipe, use the following: 1 cup apple juice + 1 tsp apple cider vinegar + 2 tsp sugar + 1/4 cup chicken broth/stock. 2. Don't let it burn because otherwise you'll end up with charred bits in your sauce! 3. I really recommend using a meat thermometer to ensure you cook the pork perfectly. BUT if you don't have one, pierce the pork in the middle and when the juices run clear, it is done. 4. Fennel and apple are classic pairings with pork! Fennel Apple Salad - use a mandolin to finely slice 1 large or 2 baby fennels. Cut 1 red apple into thin batons. Toss with lemon juice, olive oil, salt and pepper and a good handful of fresh parsley leaves. 5. 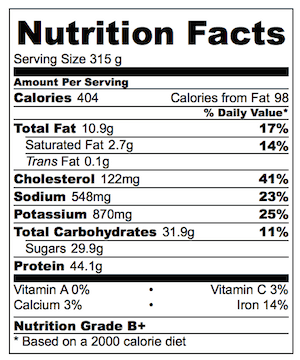 Nutrition per serving, assuming 3 servings and all the sauce is used. Hi Nagi, I have made this recipe many times and it is fabulous! This time I grilled the tenderloin on a grill mat for approx 2o min at medium heat,flipping half way through until the temp reached 140, I reduced the marinade in a pan on the stove and then poured the glaze over the sliced tenderloin. It was fantastic, just the right amount of char, definitely my new preferred way to cook this. Thank you so much for another great recipe. I had some pork fillet, and I was cruising online for the right recipe… I had come across two things, apple cider pork, and that you should always marinate fillet. I didn’t have all the ingredients for many of the recipes, or I didn’t like some in others… so I had plonked the fillet in some cider and kept looking, and I thought, ‘what would Nagi cook’ and your recipe came up! Your website has given me so many wonderful recipes, thank you ever so much! Nagi. I am like, your low key, friendly recipe stalker on the other side of the planet. I have made so many of your recipes at this point, I’ve lost count. I also haven’t rated all of them, so forgive this transgression. But damn, lady. This recipe was out of this world. I had a 2.5lb loin, so just doubled everything, and, heck yeah. I use pork loin a lot; great cut of meat, not expensive, lots of bang for your buck. This marinade/sauce will definitely be in the top 2 rotation from here on out. One of the things I appreciate most about your recipes is that I almost always have the ingredients in my pantry. You don’t get better than that. So. Yes. Apple Cider Marinaded Pork Loin. So much yes. We made this tonight and used a can of lone tree ginger apple cider, a product here in B.C., Canada. Wow. We will be serving this to company. Thanks so much, Nagi. This is really delicious and easy to make. It’s a keeper. The cider I had was labelled dry, but the sugar and honey added just enough sweetness. I love your writing and your recipes, Nagi. Thanks. I made this tonight for my husband and son for sinner (I am vegetarian) and they both really liked it. I used Angry Orchard Hard Cider, which is available here in Ontario, Canada and it worked well. The only suggestion I would make is to include the marinating time in the prep time, as I have (not this time, but at other times) looked at recipes that said they took a certain amount of time, only to discover that they should have been marinating for 12 hours before. (I know I should read the whole recipe ahead of time, but this would just make it more fool proof). Thanks for a great recipe! WOO HOO!!! So glad you enjoyed it Vivian! I’m sorry about that, I will ensure I add marinated time at the top. Unfortunately I don’t have an extra field for inactive prep time in the recipe template I use, I really want it! Looks delicious Nagi and yes cider is very good to cook with. i too have been known to cook and drink simultaneously. Dear Nagi. Could you please start including the amount of fiber in your recipes? You are one of the few websites that doesn’t do this. When a diabetic is figuring out the actual amount of carbohydrates in a recipe, you take the number of carbohydrates listed and then either amount of fibre listed is subtracted free the carbohydrate number and that gives you the real number of carbohydrates, for a diabetic to be able to count and track their carbohydrate intake. As you know, this is vital information to a diabetic. There has been quite a few times that I have really wanted to make one of your recipes, but I couldn’t because I was too concerned about the number of carbs in the recipe. I love your creative recipes and get very disappointed when I’m too nervous to make one, because of the lack of the fibre information. Thanks for taking the time to read this email. 🙂 Karen Ouellet. Hi Karen! I’m sorry about that, I will try to start remembering to add nutritional information! NO!!! Leftover nachos for breakfast?? a) Did not know “Leftover Nachos” was possible. b) Breakfast?? How….what…..??? Thanks Claudia!!! Cider is so great to use for cooking, easier than beer because you don’t have to worry about cooking out that wheat taste! This looks sensational. 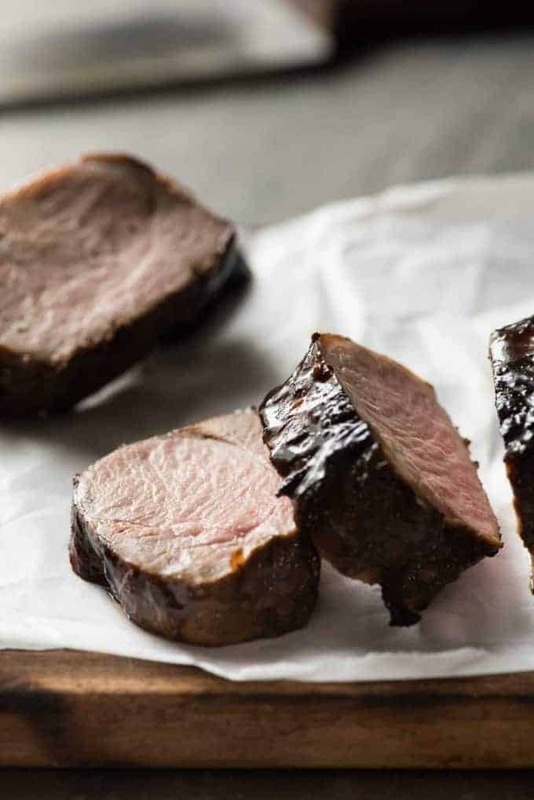 I agree that pork tenderloin is really hard to cook just right – I’ve had the pleasure of cooking it perfectly every now and again, and when it happens, J Daddy and I both swoon at the tenderness and juiciness of the glorious meat. I LOVE cider. Cider makes me smile – in the first few months of dating, J Daddy and I would often drink cold ciders on my balcony, on hot balmy summer nights, getting to know each other and talking into the night. It’s a fantastic memory. Must make this soon. I’ve discovered the BEST butchery in Eastwood, so I’ll be paying them another visit soon to get pork tenderloins. For now, I must be away to get on with my Australia Day ribs!!! Not sure what the name of the butchery is in English, but it’s the butcher at the roundabout next to Ginger & Shallots. Translated, the shop is called “88 Fresh Meat Shop”. We had such tender cuts of meat for our Australia Day BBQ and we are very impressed with the quality and the price. BA HA HA! You crack me UP Marisa!!! Oooh, I love the thought of spraying ribs with apple cider….how did I not think of that? Normally I just use plain apple juice! Oh dear gawsh – that pork is juicy indeed! I used to use beer in my chili but then had to curb it because of my daughter’s gluten sensitivity – so thank you for sharing that hard cider or alcoholic apple cider is similar to beer but with the wheat, Nagi! I didn’t even think of that – thanks for the tip Shashi! Due to a serious illness my husband is unable to drink alcohol. If I used the alcoholic cider would cooking “burn off” the alcohol? Hi Frances! I would avoid this because though the sauce will be fine, I would worry about the tiny amount of alcohol absorbed by the pork which does not get cooked out. Can’t taste it, but it will be there – a teeny tiny amount. Please use the non alcoholic cider using the notes in the recipe! I have some fresh apple cider that I need to use up is there some alcohol I could mix with it to use? 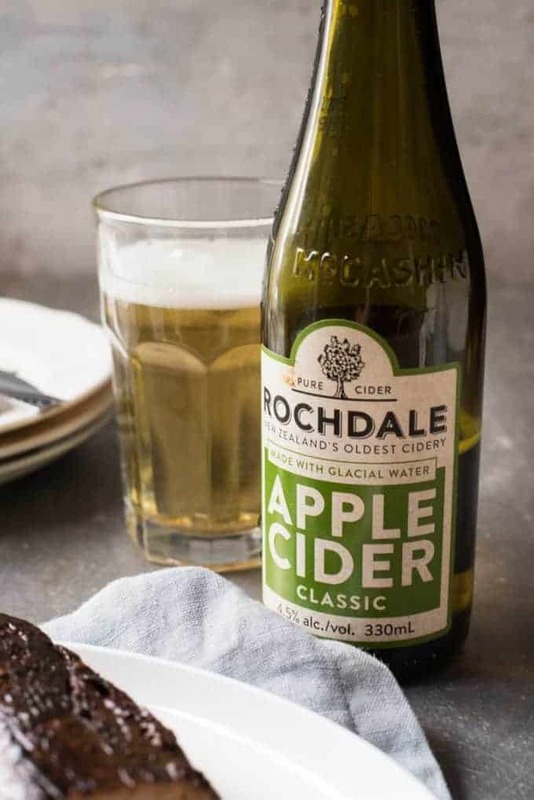 Live in the US, so chance of me finding Rochdale cider are slim. Hi Nancy! If you refer to the notes, there is one for how to use fresh apple cider. Otherwise, any hard cider – sweet apple hard cider – will do just fine! I never knew in some places apple cider came with no alcohol! I love the combination of apples and pork, this recipe a must try.